Another August means another wave of young men and women who seek to imprint their names in the mold of Howard history. After a tumultuous year with the ongoing housing crisis and the recent financial aid scandal, some have lost faith in the institution they once so proudly boasted about. In addition, the selling of Howard-owned facilities to third party management companies has left many feeling like the haven for Black excellence is slowly but surely coming to a bitter end. The Drew Hall that had the likes of Lance Gross and Anthony Anderson once walk their halls is now owned by Corvias, a community developer. Such changes have made many feel that Howard just is not Howard anymore. Howard, the stomping grounds of revolutionary thinkers such as Kwame Ture, Zora Neale Hurston and Alain Locke is now a gold mine for white politicians, investment groups and companies to prey upon. In any case, Howard admitted over 5000 students for this year’s freshman class. Despite the many headaches Howard gives its students, it boasts a large freshman class year after year with interest in the school forever on the rise. The parties, the social organizations and the exceptional women are all tantalizing when thinking of which college to attend. But none of these are monumental or unique enough to garner a class of 5000 students ready and willing to give four years of their lives, and money, to Howard University. So what is it? What about Howard is enough to make one forget about sleeping in a triple in Drew or not having hot water in College Hall South? What makes us see past the lack of A/C in classrooms and the frustrating wait times in the financial aid office? What alleviates the pain of not being able to have visitors come to your dorm or the disconnect between the administration’s actions and the student body’s wants? I believe the answer to all these questions can be found in the eight-day HU Resist-led sit in this past spring. The Occupation of the A-Building was, in my opinion, more of a testament to the spirit of Howard culture than a movement that amounted to any degree of change. With demands such as the disarmament of campus police officers and placing a freeze on the tuition being woefully ignored, the protest provided a space for discourse rather than full scale revolution. The sit-in started seemingly spontaneously and immediately attracted the attention of the institution and local news agencies. For days, we watched as the sit-in was covered by both local and national news stations. Our families even watched from back home on major networks like CNN. Demands for better housing options, effective solutions to the high cost of attendance and suitable programs for students with mental health issues were expressed by students who refused to leave the A-Building until these demands were met. Throughout the duration of the sit-in, students donated their time, food, water and connections to ensure that the movement did not lose momentum. For the first time in my Howard career, I saw a complete campus. Students came together in various capacities in a collective effort to see the institution they love so dearly do better. 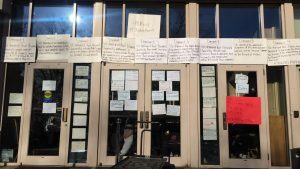 While all of the demands of the sit-in were not met, the sentiments of the movement left a spark on campus. Howard had not seen students mobilize in that fashion since the A-building occupation of 1989. Now in 2018, we are looking at how this protest has affected the perspective of incoming freshmen. While the media attention brought to the University’s issues by the protest was definitely an added source of stress for this year’s freshman class, it wasn’t enough to overshadow the allure of Howard University. Now that they’re here, what we’ll have to wait to see whether the spirit of protest awaken last Spring will rub off on the freshman class. What will it propel them to do? As both a student of Howard and a social commentator, I cannot help but watch with eager eyes at how Howard ‘22 will navigate, transform, and lead the Howard U we have all come to love to hate.